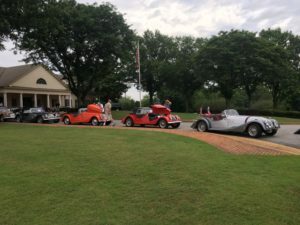 “Morgans Making Whoopee” was held June 22 – 24 at the Ford’s Colony Marriott Country Club in Williamsburg VA. The beautiful club setting included pools, tennis courts, golf course, great restaurants, all within walking distance from the lodging. 15 Morgans lined the circular drive of the club house. Country ride to the Berkeley Plantation was enjoyed by those who were able to arrive on Friday. Dinner following the plantation was at Indian Field’s Tavern. Food, renewing friendships and meeting new owners was great. Driving back to the hotel was challenging due to a torrential storm. Directions for the Rally by Bob and Missy McKenna were written in rhyme! First you needed to decipher the rhyme to figure out what you were looking for which added to the fun while you passed Morgans coming and going as they missed the clue. We must have guessed correctly as we were ‘given’ 3rd place even though our mileage was twice the others. Taking a ferry ride to the Surry Seafood House was enjoyed and gave more time for ‘noggin’. Autocross and Gymkhana were well done. Karen, who has been driving Morgans for 50 years won the Women’s Autocross. The Banquet Dinner at the club was most likely the best banquet meal we have ever experienced. More laughter than business as we had 2 who couldn’t seem to ‘behave’. Never have I laughed so hard thanks to Joe T. and Barry A. – best ‘off the cuff’ comedy we have experienced in years! MOGSouth members were there ‘in force’ – The Buckleys, Leos, Topinkas, McKennas, and Bernaths. Our wonderful hosts Bruce and Gail Trabb, MOGSouth members, planned a fun filled 3-day meet. Congrats to the Leo’s for their 1st place Concours win with their beautiful 4/4. 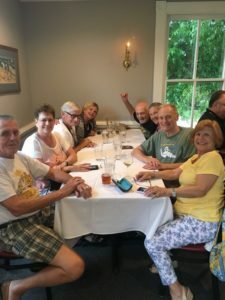 Sideline – on the way home we stopped in New Bern NC and ate at Morgan’s Tavern and Grill. Great food! New Morgans Coming to North America ! 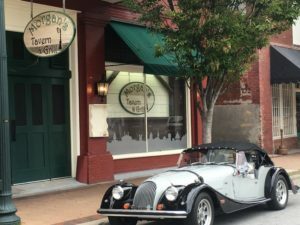 The Morgan Motor Company has just invited ALL North American Morgan Dealers to participate in a Component Car Program. Morgan Plus 4s and 3.7L Roasters will be delivered to the US (without engine and transmission) where these driveline components will be then be installed. Each Dealer’s Participation level and build slot availability may be different and each US State has different vehicle registration laws, taxes, etc. Contact those Morgan Dealers of interest for specifics on costs, options, availability and to register your interest in a new Morgan. Click Here for the Morgan Dealers supporting MOGSouth. Folks, a good number of historic MOGSouth Newsletters have been scanned and added to the web site’s Newsletter Archives thanks to donations from Fred and Gay Hollinger. Many have color pictures of us in our ‘younger’ (not so fat??) years. Interesting to peruse with the morning coffee. If you find you too have some older Newsletters, that are not already on the web site, please let me know. This site acts as the MOGSouth historical record and scanning these documents and adding them to the archives is a very good thing.